But first, lets talk about Araloth himself. 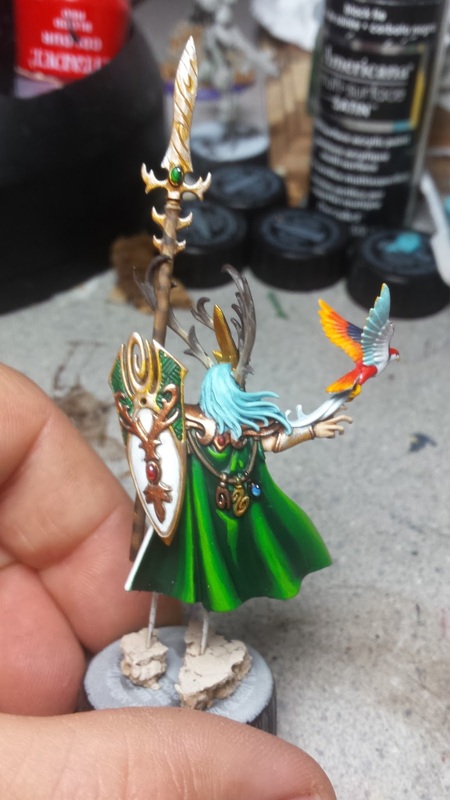 his cape and painted that first using Caliban Green, Warpstone Glow and Moot Green. I base coated it with Caliban Green and then painted the raised sections with Warpstone Glow. Then once they were dry I laid some more of each color down and blended it wet on the mini. Then I did the same with Warpstone Glow and Moot Green. The results were great! I ended up with a really nice contrast on them and I think it's probably the best green, and best cloak I've ever painted. I new I wanted him to have golden armor. But I'm not a fan of the GW ones or the Vallejo ones. But I love GW's newly released AoS golds, but they're always sold out. Luckily, I found some last weekend and was able to knock out the armor. But I realized too much gold is a bad thing and needed to tone it down a bit. So I looked through my metallics and plucked out the bronze/copper colors and did a bit of accent work. It worked well and helped give his armor a bit of pop. His bird was a nice challenge. I usually dislike painting birds or animals, but this one wasn't that bad. I knew I wanted it to look tropical. I started with a base of Evil Sunz Scarlet, then I added some Yuriel Yellow to the edges of the wings. I then blended the two in the same fashion as Araloth's cloak. 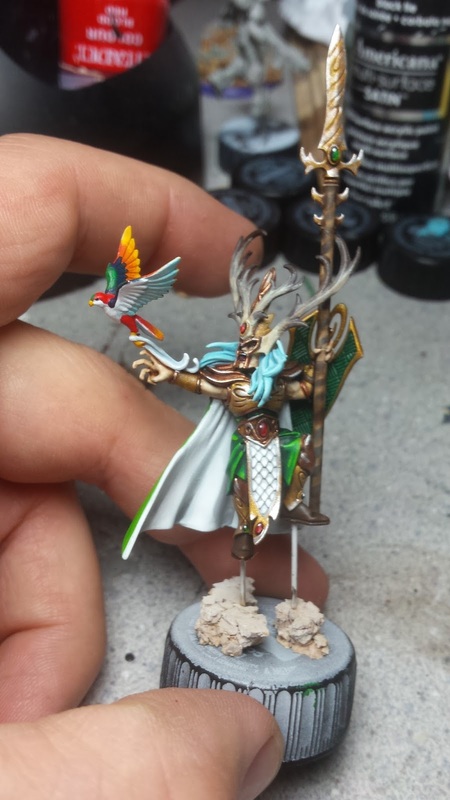 To help give the bird a more tropical feel, I added a bit of blue to the top of the wings and blended that with Warpstone Glow. Then I painted the underbelly white and blended in some light blue into the underwing areas. He's gotten a lot of praise, which surprised me, because I think he should have been a bit better. But as they say, the artist is the worst critic of their own work. Now, lets talk about the base. 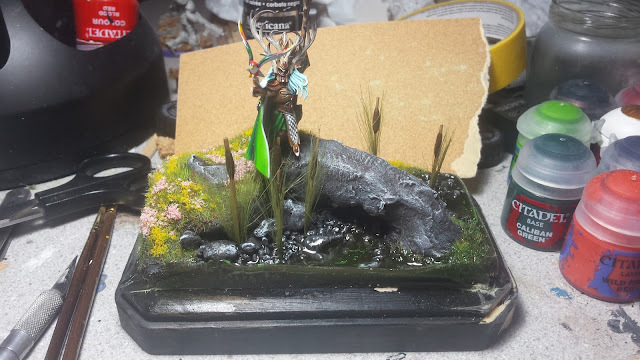 I painted up the base as I normally would, but something seemed lacking. So I ran to Hobby Lobby and picked up some stones, long grass and a water effects kit. 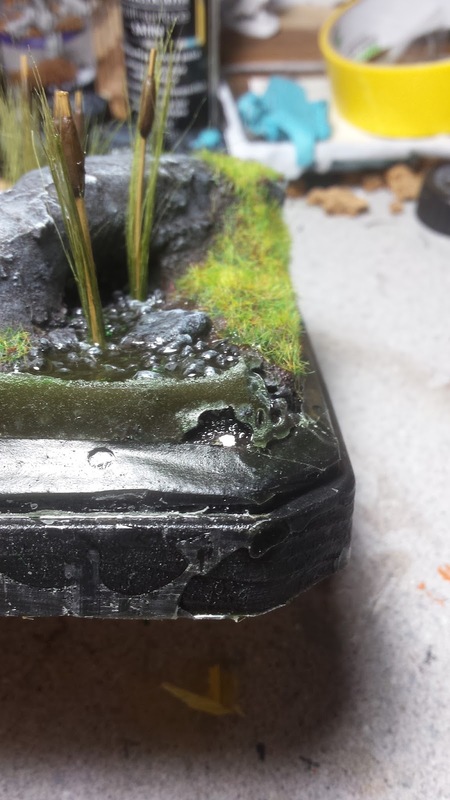 I then added in the stones to the lower area to act as a river bed. 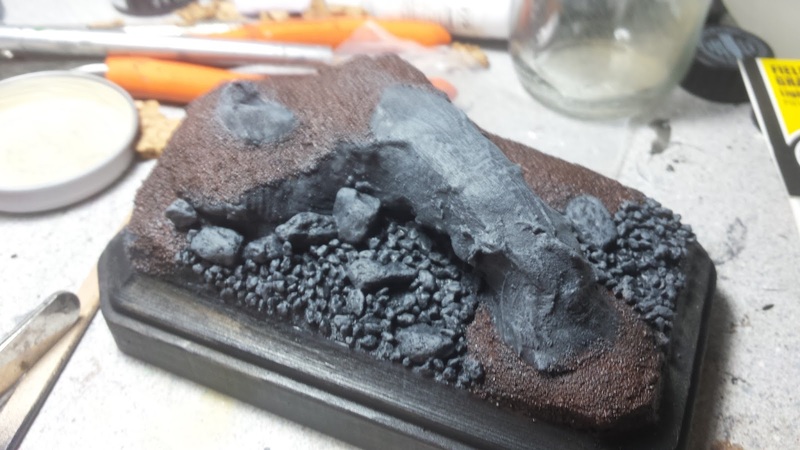 The rocky areas were then drybrushed with various greys before being washed with Agrax Earthshade, Reikland Fleshshade and Seraphim Sepia. These washes were applied in streaks and splotches, to help give the stone a bit more color. Then they were washed fully with Nuln Oil and drybrushed again. until I poured the resin (I didn't use the water kit I had bought). I had taped the base completely and it should have been fully sealed. It ended up with a slow leak, requiring a second pour in order to get coverage on the stone. Luckily the 1st pour was dry and plugged the leak point, so the 2nd pour went off without a hitch. I let it sit for 3 days curing. Finally it came time to peel the tape back and see what the damage was. I figured the resin was just seaping between layers, but somehow it went under the base later of tape and flowed out underneath. This meant it ended up with resin all over the wooden base and I had a void without any of it. 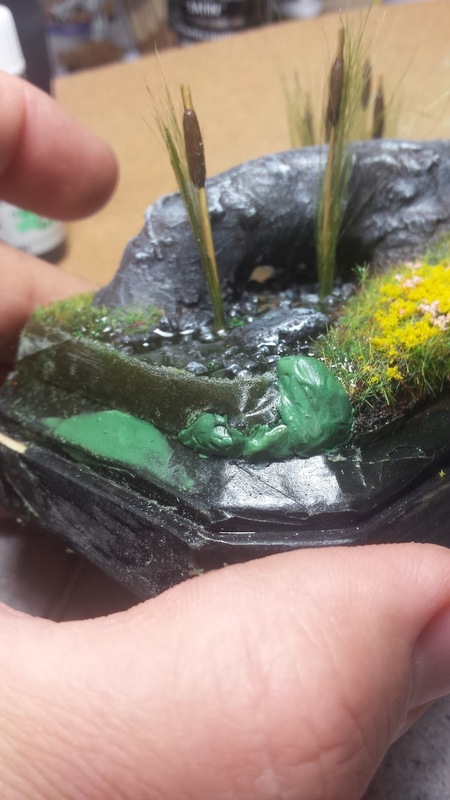 Luckily I was able to clean up most of it with an x-acto knife and after talking it over with Twitter buddies I came to the conclusion that the void would need to be filled with Green Stuff to form a new set of rocks. He's close, super super close. The green stuff should be cured by the time I'm home from work and then it's just a matter of painting the new rocks and the base. But even with the issues, he still looks pretty damn awesome.